I had leftover triangles, which led to an idea for making lightning out of them. I thought about lightning bringing life to color, color to life. The triangles didn’t work the way I had in mind, so I decided to go with free-form cut shapes instead and threw out the triangles. I was influenced in part by a class taken with Jane Sassaman. A curve pieced background and fused lighting and amoebas. The fabrics used are all my own hand dyes. This quilt was made for the APWQ Auction a few years back. So long ago I kind of forgot about it. I was so pleased to be asked if I would make them something for this show and auction. 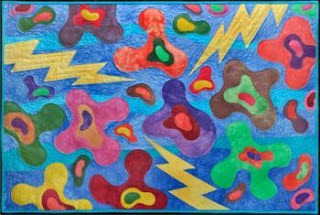 I have had many quilts in their show over the years and even got a prize one time. The quilt has been travelling around the past few years. To see more of the auction check this out. There are a number of Canadian ladies here. If you have ever thought you would like to own a quilt from a great quilter this may be a great chance. The auction is Saturday Aug 27th 2011 at the Gala Dinner. 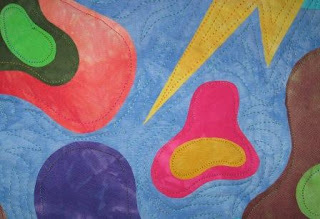 The Quilt show is also great with many many wonderful quilts to see. If your are able to go, Just Do It. Happy Father's Day I am going to a horse show in Calgary with my Dad. Cavalia not your normal horse show.